Save The Snakes supports the work of Kamal Devkota to reduce human-snake conflict in Nepal. Kamal Devkota is a snake expert, conservation biologist and board member at Nepal Toxinology Association. Kamal recently conducted a district level workshop titled “Human Wildlife Conflict and Save Snakes Save Nature” in Nepal. The workshop was held on the 4th of May at Hotel New Era, Butwal. Delegates from various departments were invited to participate in the workshop including the District Forest Officer, conservationists, academics, health personnel, community forest user groups, political leaders, as well as media personnel from local and national newspapers, television and radio. This is the first time such a workshop has been executed in the Rupandehi district. Current wildlife policies and conservation practices in Nepal are not sympathetic to snakes. Through the district level workshop, Kamal and his team highlighted the urgency to implement policies for snake conservation. 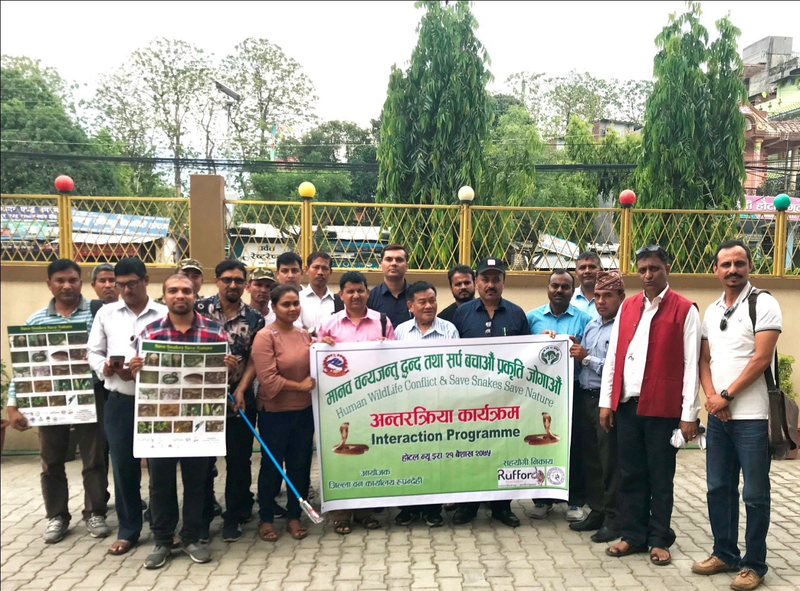 They also provided conservation recommendations to the participating delegates to conserve snakes and their habitat, not only in the Rupandehi district, but also in the rest of Nepal. Before the start of the workshop, the delegates were requested to fill out a questionnaire to find out the level of awareness among them. The attendees were curious about the questions and Kamal anticipated to have a good discussion during the workshop. The District Forest Officer, Romraj Lamichhane, initiated the workshop with valuable information about “Human Wildlife Conflict Management” in the Rupandehi district including snakes and particularly pythons. He informed the attendees that the Forest Department in Rupandehi has rescued and relocated seven pythons within the 2017/2018 year as well as some mammal species. The Assistant Forest Officer, Yagyamurti Khanal, from the Sector Forest Office in Butwal, followed up with a presentation titled “Guidelines about compensation for damages caused by the attack from wild animals”. To end off the major presentations, Dr. Chhabilal Thapa spoke about first-aid after snakebite, clinical signs and symptoms and the medical importance of snakebite and snakebite management. District Forest Officer, Romraj Lamichhane talking about “Human Wildlife Conflict Management” in Rupandehi district. DFO, Romraj Lamichhane talking on “Human-Snake Conflict” in Rupandehi district. Assistant Forest Officer (AFO), Yagyamurti Khanal, from Sector Forest Office, Butwal, has presented “Guidelines about compensation for damage caused by the attack from wild animals”. Dr. Chhabilal Thapa talking on snakebite management in Nepal. Romraj Lamichhane, District Forest Officer (DFO), Rupandehi, being handed over Five Mounted Laminated Framed Poster at the district level workshop. Surya Kant Sigdel, Secretary, Ministry of Industry, Tourism, Forest and Environment, Province No. 5, being handed over the Mounted Laminated Framed Poster. During the interaction and discussion session with the attendees, Dr. Thapa and Kamal answered the questions from the questionnaire and clarified any queries about snakes, snakebites and snake conservation. They also informed the audience about their ongoing work and discussed implementation of more initiatives including the selection of schools/colleges for awareness campaigns, workshops in the communities, establishment of a snake rescue center and a snake information center, snake handling training and tong distribution programs. They ended off the workshop on a positive note and distributed brochures (both in English and Nepali), posters, souvenirs, a health bulletin and mounted laminated framed posters. The workshop was well covered by on local and national newspapers, television and radio. The news coverage and interviews on Kamal’s project “Save Snakes Save Nature” helped them to reach out to thousands of people, not only in Rupandehi district, but also in other districts.